Like many business owners in bakery – and food in general – I’m only too aware of the skills shortage in the sector, particularly for handcrafted products. It can be difficult to find highly qualified, expert bakers; people with a real instinct for good bread. For this reason we’ve always been passionate about training, both on the job here at Paul Rhodes Bakery and in more formal ways. For example I regularly run bread sessions for students at Le Cordon Bleu Cookery School here in London. I am very happy to announce that we now have a new collaboration that kicked off last month with E5 Bakehouse, supporting its brilliant ‘Just Bread’ training initiative. Just Bread is a programme run in conjunction with the Refugee Council and provides an incredible opportunity for migrant women to take part in a ten week bread making course, as well as learning about the daily running of a busy café and bakery. 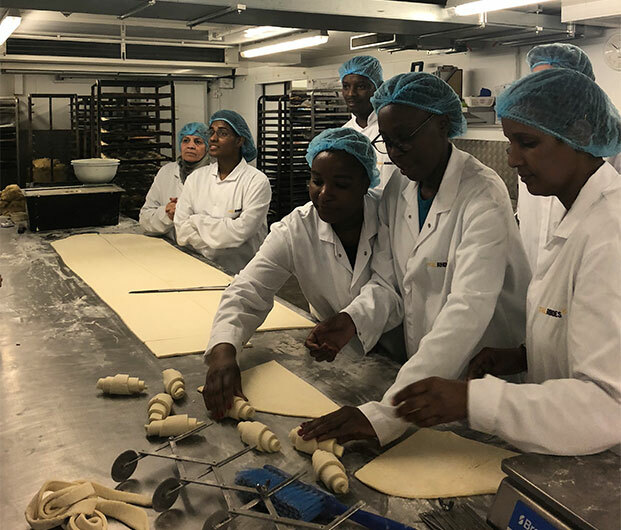 E5 has recently started its sixth course and we welcomed the trainees to Paul Rhodes Bakery so that they could try their hands in the art of cake decorating, icing biscuits and shaping croissants. The refugees come from a wide range of backgrounds and many are highly skilled in their previous fields but are struggling to find similar work here in the UK. Just Bread finds people with a passion for bakery – whatever their background – and then helps equip them for a possible new future within the sector. The programme is all about supporting people who have had a difficult time but it also plays a vital role in keeping important skills alive and we are both delighted and proud to be taking part. And our commitment is not just about putting a few days aside for each course. We applaud what E5 Bakehouse has created and feel very strongly about providing genuine opportunities where we can. For this reason, we will guarantee at least one graduate from each Just Bread intake full time employment with us, when their course is completed. 2018 is the 15th anniversary of Paul Rhodes Bakery and the business would probably not be here today, and thriving, if I hadn’t have been given a lucky break – or had an excellent mentor. My break with bread came one day when I was working alongside the great French chef, Pierre Koffmann. I had been working across all sections of his kitchen but when the bread guy left quite suddenly I was asked to step in. I saw this as a great opportunity to learn from the master. I was 21 then and that guy leaving inadvertently put me on the path to where I am today, allowing me to discover and develop a true passion for bread. So, if we can assist with developing that passion in others and training and mentoring them at Paul Rhodes Bakery, I will feel that I am ‘paying it forward’, as well as helping to ensure the future of core skills in our sector. The next group of students starts their course in June and we look forward to meeting them then, when hopefully one of their predecessors will already be with us and can demonstrate that this course really does offer amazing opportunities.